1 I can't remember my Kakao Account email. Open the content area. You can find your Kakao Account on Kakao Talk and Kakao Story apps, and Kakao's homepage (www.kakao.com/main). 1. Are you using Kakao Talk? 2. Are you using Kakao Story? 3. You can also find your Kakao Account on Kakao's homepage. - Are you using Kakao Talk or Kakao Story? 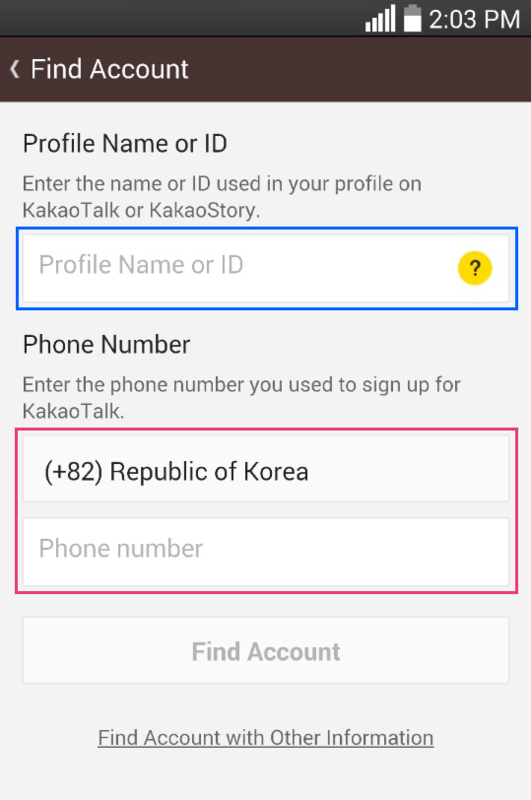 You can find your Kakao Account with name or ID used in your profile on KakaoTalk or KakaoStory and the phone number you used to sign up for KakaoTalk. Part of your Kakao Account is shown as *** for your privacy. You should remember the masked part of your email address. - When you sign up for a Kakao Account, we send a welcome email to the email address associated with your Kakao Account. If you can't remember your Kakao Account, check the inbox of your email and look for "Kakao" or "Kakao Team". The email address which has received the welcome email is highly likely to be your Kakao Account. 2 I can't remember my Kakao Account password. Open the content area. You can reset your Kakao Account password on Kakao Talk and Kakao Story apps, and Kakao's homepage (www.kakao.com/main). 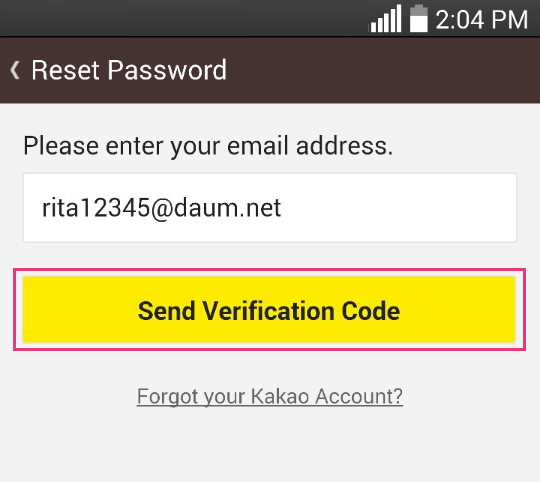 To protect your Kakao Account, you need to go through a verification for the email address used for Kakao Account as well as user identification as part of the password reset process. If you can't go through email verification or pass user identification, you cannot reset your password. [!] Please make sure to use a safe password. - Other people may easily guess your password if you use well-known names, your birthdate, phone number, etc. - Please use a unique pasword with a combination of upper/lower case letters, numbers and symbols. - Please use a different password for your Kakao Account and your Kakao Account email address to ensure security, and change it regularly. 3 I cannot check the verification email. Open the content area. 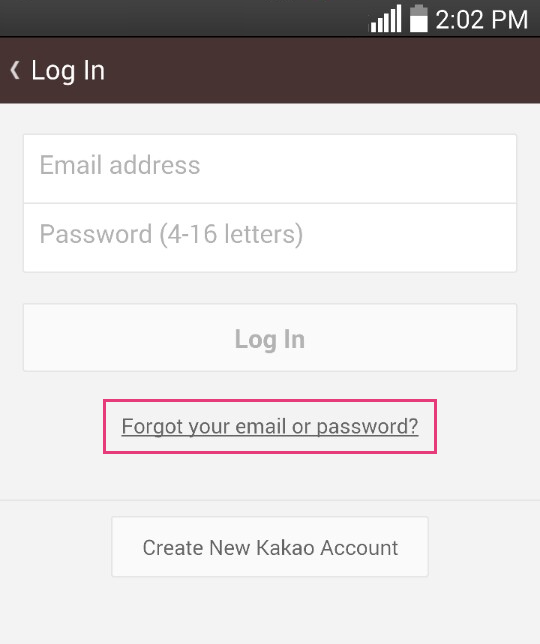 Are you unable to check emails sent to the email address used for Kakao Account for the following reasons? 1. Have you made a mistake when typing the email to create your Kakao Account? Please check if you have entered a wrong ID or mail domain (For example, @gmail.con or @gmai.com etc.) in your email address. 2. 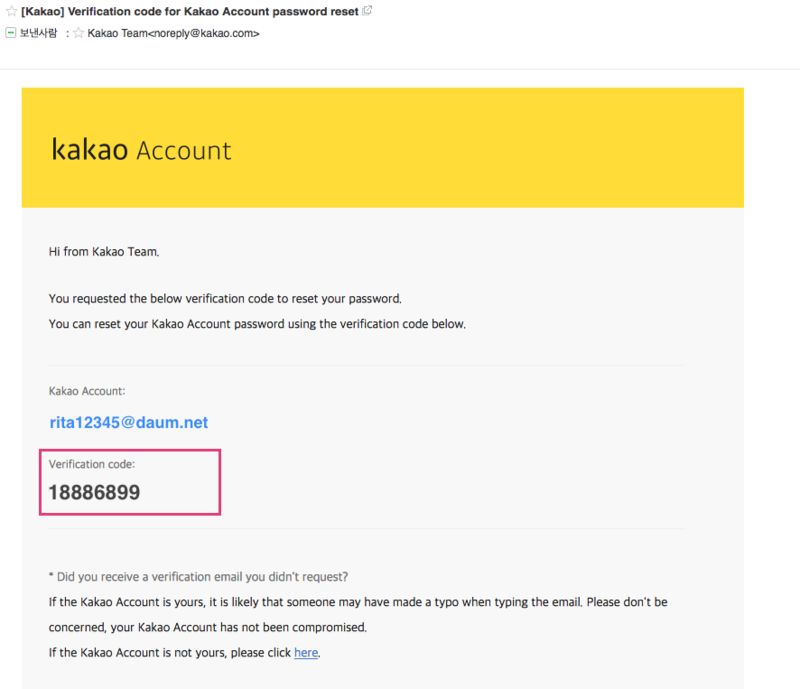 Have you signed up for a Kakao Account using a random email address you don't actually use? 3. 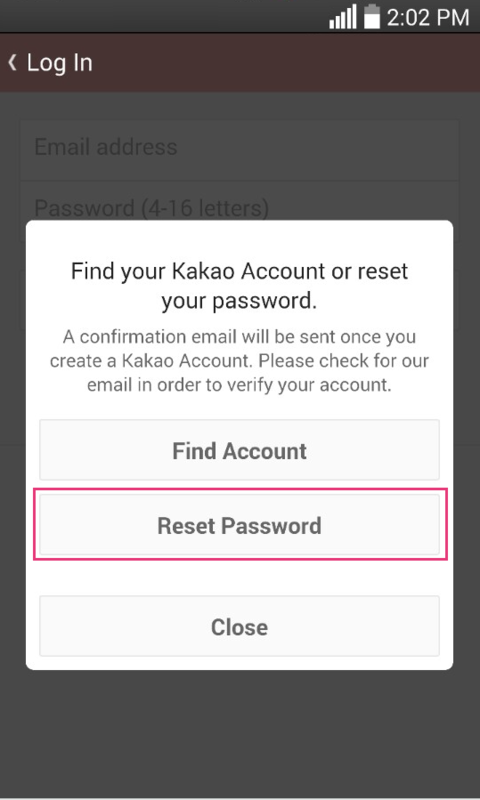 Are you unable to access the email address used for Kakao Account because the email service has been terminated or you have deleted the account? 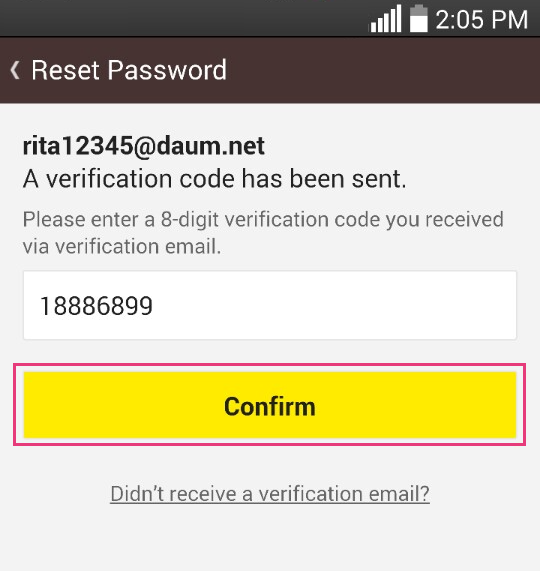 In this case, you can change your Kakao Account email to an active account and get verification. Please go to the Kakao Account menu on the Kakao Talk or Kakao Story app. 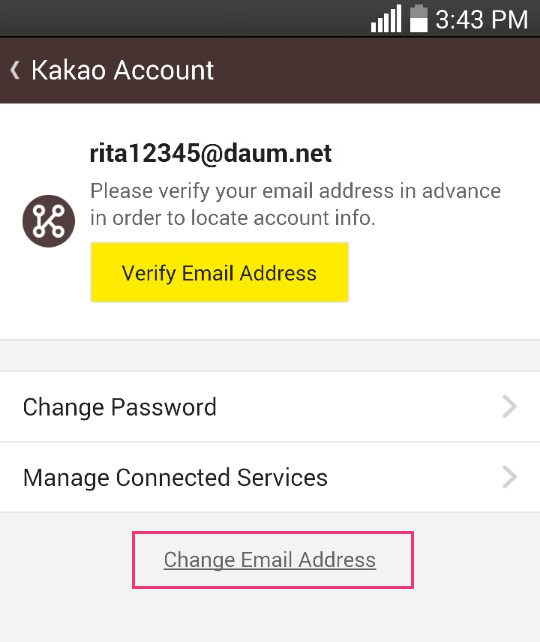 Tap the "Change Email" and you can change your Kakao Account email to an active email address. If you can't find the "Change Email" link or cannot log in because you forgot your password, please contact our Customer Service. We wll help you change your email after verifying some information. 4 I am trying to find my password but don't know what my previous phone number is. Open the content area. To prevent other people from logging in with your Kakao Account, you must provide your previous phone number associated with your Kakao Account or the previous phone number used for Kakao Talk when finding a password. You must remember your previous phone number because Kakao cannot tell you. If you don't remember your previous phone number, please check the instructions below and try again. 1. 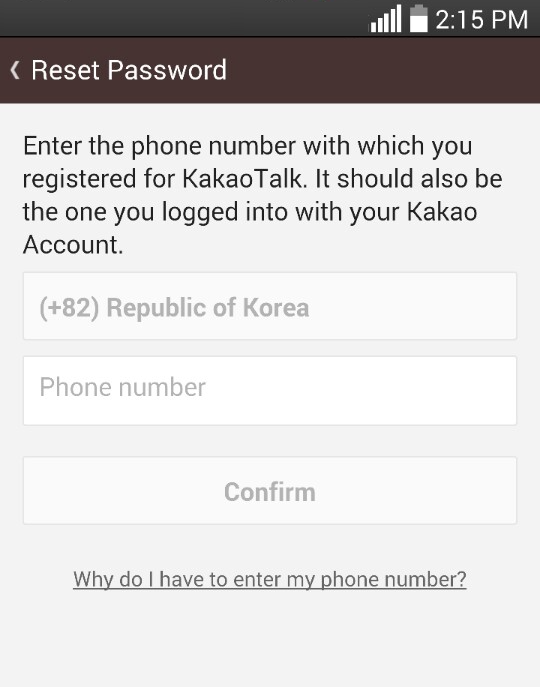 Is Kakao Talk still installed on your previous device? 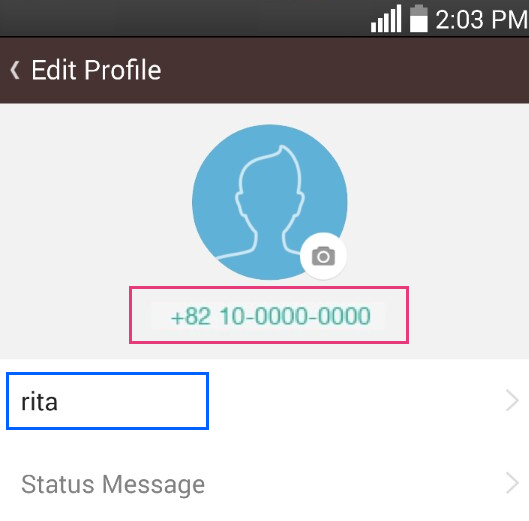 Open Kakao Talk and you can find the previously verified phone number in More > Edit Profile. 2. Has your phone number changed? If your phone number has changed, try to recall the previous phone number and enter that number. If you can't remember the number, ask your family or friends if they have your old phone number. If that still doesn't work, contact your mobile service carrier or mobile phone agent. 3. Have you switched to a new phone or a new carrier? When you switched to a new carrier, or re-subscribed to the mobile phone service with the same carrier, a temporary number may have been issued and changed without your knowledge. Contact your mobile service carrier or mobile phone dealer and ask if your phone number has been changed or if any temporary number has been issued. 4. Have you used a no-contract phone which had been owned by someone else, or have you logged in from a shared device? It is possible that the device you used to log in may already have a Kakao Account with a different phone number. Please ask the previous owner of the device about the phone number. 5. Have your family or friend logged in with your Kakao Account? If your family member or friend has logged in with your Kakao Account to access Kakao games or other services, try entering that person's phone number as the previous phone number. 5 I don't know the answers to the security questions. Open the content area. We do not provide correct answers for security reasons. Please try again later as you may retry once a day. Tap "I'm not sure" if you don't know the answer to the question. 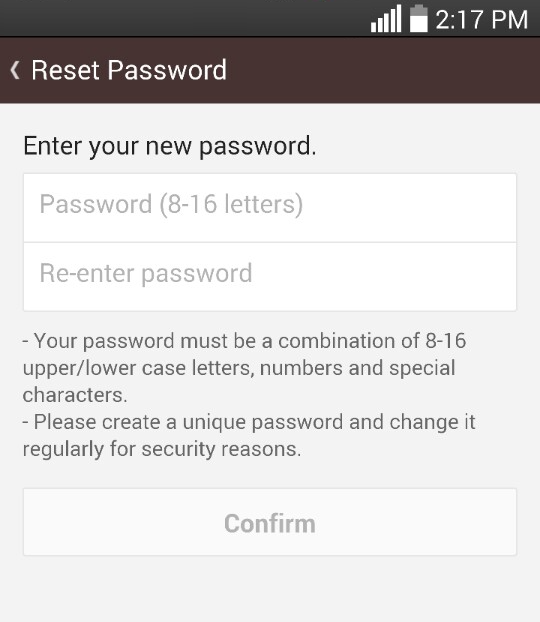 6 I am unable to get the verification via phone call to reset my password. Open the content area. Verification via phone call is required to reset your password. - On your Kakao Talk or Kakao Story, go to Edit Profile > Kakao Account > Change Password and click "Forgot your password?" - If your previous phone number started with 01x (011, 016, 017, 018 or 019) and was transferred to a 010 number, you can get the verification via phone call using the 010 number. If you have tried the above and still cannot reset your password, please contact our Customer Service. 7 I was trying to find my password and the profile appeared, but it is not my profile. Open the content area. It is likely that someone may have accidentally entered your email to create a Kakao Account, or the email address may have been used by another person previously. If the Kakao Account is not yours, please click the link at the bottom of the login notification email "Is this NOT your account?" and contact our Customer Service.